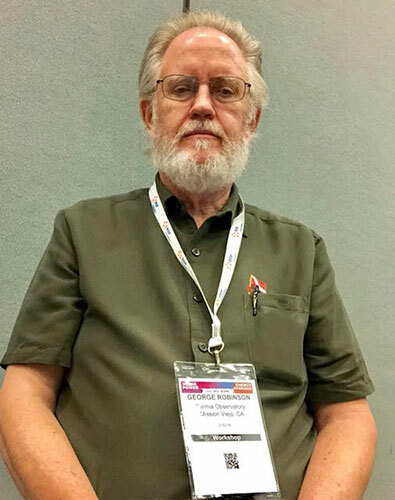 Palmia Observatory: Energy Storage Workshop at Solar Power International; The Duck Curve; Can lightning create gamma-rays and antimatter? Energy Storage Workshop at Solar Power International; The Duck Curve; Can lightning create gamma-rays and antimatter? 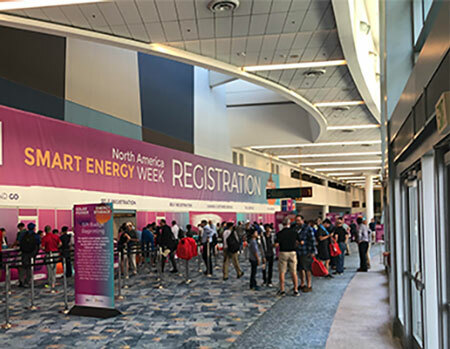 Well we are packing our bags for our three observatory tours but there was still time to take in one day of energy storage workshops at the Solar Power International (SPI) conference (Sep 24-27) in Anaheim, CA. So, I can make some comments about the workshop and make some separate comments about some of the new findings coming in about how lightning can generate gamma-rays and antimatter. The SPI typically draws more than 20,000+ visitors, but luckily one the first day of workshops the crowds had not yet shown up. As you can see the lines at registration are not too crowded yet. In my previous life I worked on distributed generation systems and tried to extend that technology into the renewable energy market. It turns out that energy storage is going to be a key technology to enable more and more renewable energy, like wind and solar, to be connected to the utility distribution system. Without energy storage it is hard to integrate variable energy sources, like wind and solar, into a utility system with customers that want continuous access to quality energy. These workshops presented the current state of the art for some of these storage systems. There was a lot of interest in hearing what was happening in this area. Unfortunately, for someone like me who is interested in the technology and science of energy storage, many of the presentations were about the regulatory issues and financing issues. 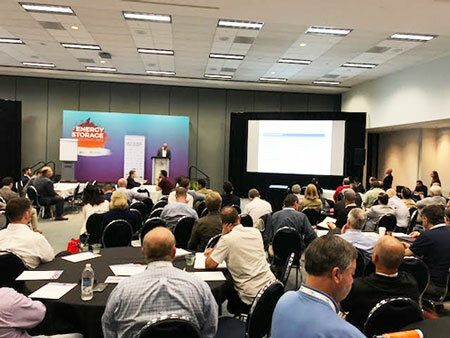 Now all of these issues are important and it was encouraging to hear that tax codes and regulatory codes are being updated to incorporate energy storage systems. Many of the speakers were tax attorneys and accountants. One speaker remarked on latest tax code changes that allowed for solar panels to be included as real estate, making possible some tax options like Real Estate Investment Trust (REIT). On the financing front, now that the service life of solar power systems is approaching 30 years, that the financing terms are also increasing from the usual 6-10 years, to the full 30 year expected life of the system, this is a good thing. That is encouraging and will help make the business case for installing these systems, but for me, with my physicist wannabe hat on, and since I no longer wear my engineering hat or my MBA financing hat, I had a hard time staying awake during some of the presentations. Anyway, all in all, it was a pretty good workshop. Many speakers commented on the continuing decline in energy storage system costs, which is a good thing. Solar and wind power costs are declining much faster and now often competitive with gas fired generation. One speaker said that their studies found that the ideal "100% renewable" case was probably not cost effective and a better approach would rely on something like 5% gas fired generation to be the more cost effective mostly all renewable electricity mix. Some doubted if nuclear power could ever be completely eliminated. 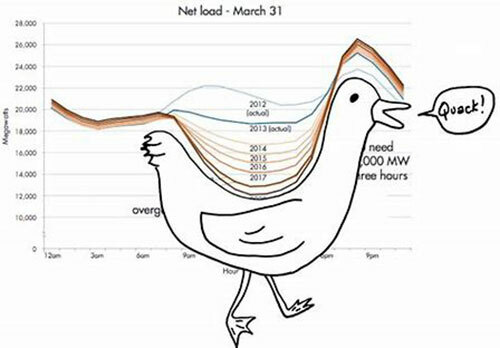 Let me say one thing about the famous "duck" curve that tells the situation of the mismatch between the peak solar power production and the peak time of most typical utility load systems. Now I had seen the curve many times before, but sort of like some groups of stars that make up the constellations, I couldn't quite make out where the duck was. Well, one presenter talked about the duck curve and here is where most people see the duck. The net load is the total utility load that must be satisfied by conventional generators after accounting for the benefits of solar power. Note how from midmorning to midafternoon, when the sun shines very well, then the need for the more conventional generation has been declining during that period. But later in the afternoon, the demand for conventional generation rises very, very quickly, The expected benefit of energy storage is to smooth out the duck curve and to fill in some of the missing generation in the late afternoon. Otherwise, the system requires more standby conventional generators, which are only used during these peak conditions, which drives up the cost of electricity for all users. The more cost effective solution is to charge up energy storage systems when the sun shines and then release that energy back into the system when the sun goes down. Finally, back at the observatory, I checked out an email from Visionary Physicist, Dr. Don, which presented some of the latest findings, as of the article in Phys.org, dated 11/22/17, where antimatter and gamma-rays have been found to be created during some types of lightning discharges. Wow, not this is pretty neat stuff! Previously, I had expressed doubt about such findings because I could not see how lightning could cause nuclear reactions and such as necessary to generate gamma-rays and antimatter. Yes, lightning can be destructive but it just didn't seem possible to have enough energy to cause nuclear reactions. Anyway, Dr. Don and I had been talking about this topic for some time now and it was great to get some new information. Thanks for that, Don! So check out the figure below which shows the results of a study by Kyoto University. 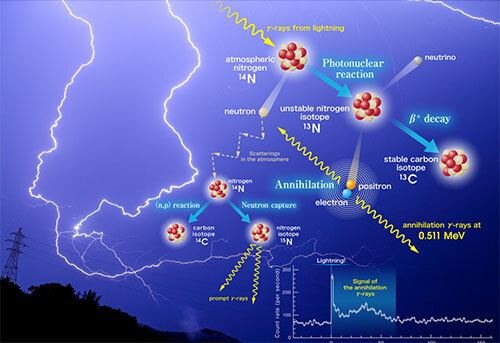 For incoming gamma-rays of energy greater than about 10 MeV, all of these reactions can occur. 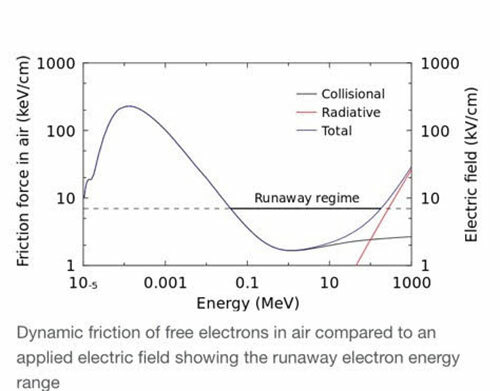 Now, I had seen similar figures before and yes, the photonuclear reactions seem to be standard type of stuff, but notice that the incoming gamma-ray is shown just coming into the reaction area and no indication of how it is formed by the lightning discharge. So, we will come back later to how lightning discharges can generate gamma-rays with energies above 10 MeV. A review of the actual published paper gives more details of how the measurements were made. Check out the figure below which is taken from the original paper. 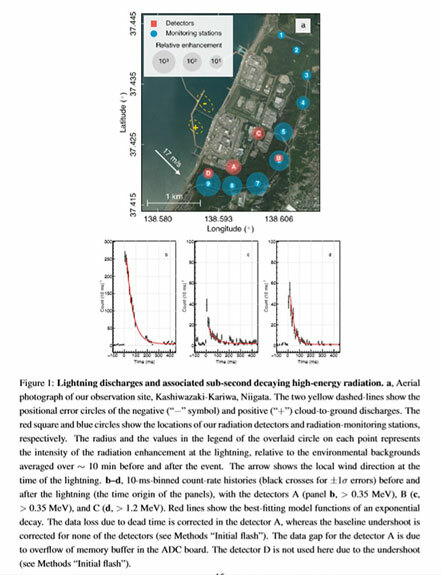 The lightning discharges were observed in one location and then when the prevailing winds carried the associated clouds over other monitoring stations, the decay products and radiation could be observed there too. The original paper contains a lot of technical details about how the lightning discharges are known to be associated with the measured gamma-rays and antimatter. I am not repeating the arguments here because they are complicated and detailed for me to try to summarize here. Check out the original referenced paper if you want to see all of the details. But let's go back to my initial skepticism about lightning being the source of the gamma-rays. Check out the figure below, which I have seen many times before. Yes, it shows gamma-rays associated with a lightning strike, but it also shows an incoming cosmic ray. How do we know that the Terrestrial Gamma-ray Flash (TGF) is caused by lightning and not by the indicated cosmic ray? Note also that in this figure the gamma-rays are shown moving upward. The previous study and others, like the one to be discussed below, are able to distinguish between those events that cause the gamma-rays to be primarily directed upward, or from those events where the gamma-rays are primarily directed downward. Those that are directed upward can be detected by satellite observatories and those directed downward will only be seen by ground based detectors. There are plenty of other rare events happening way above the clouds, such as sprites and elves, which come about in this very high electric field environment, but which are still very difficult to study. This latest set of studies on gamma-rays will help illuminate these other areas also. Another just published study, R.U. 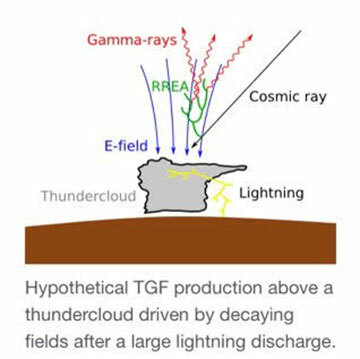 Abbasi, et al, "Gamma-ray Showers Observed at Ground Level in Coincidence with Downward Lightning Leaders", Journal of Geophysical Research, May 17, 2018, is of interest too. This study is able to distinguish between gamma-rays created by cosmic rays and those formed by other processes, like the lightning discharge. In this study, the Telescope Array in Utah, was able to detect the gamma ray showers and also could pretty much rule out that cosmic rays were the primary source. The Telescope Array was used in conjunction with another team that had installed lightning detector system at the array. So, ok, so maybe they are not created by cosmic rays. My initial skepticism that lightning could cause gamma-rays was based on the assumption that a lightning discharge could not accelerate electrons to high enough energy to interact with atoms to create gamma-rays. It seemed clear, even though a lightning discharge is powered by multi-million volt potential difference, that the accelerated electrons would just bump into another air molecule within micrometers and would lose a lot of energy in these collisions. Well, it turns out my assumption is not correct because if the potential difference is high enough the electrons get accelerated and keep bumping into more atoms and yet keep accelerating in a runaway avalanche of particle acceleration. Check out the chart below which shows the avalanche regime up to about 100 MeV. Now this blog post is not meant to cover all the details of lightning produced gamma-rays and antimatter, but only to introduce the concept, which to my student way of thinking, seems to be completely possible. We will all have to follow these new findings in the coming months.